How I’m Feeling: excited, nervous, tired, bored, curious, apprehensive, and a little scared (somehow all at once). I’m told that most first-time mama’s go past their due date but I’m still hoping to be an exception to the norm. Sleep: I’m making it work. Position: baby was head down and anterior (facing my spine aka the ideal position for birth) at our ultrasound on Tuesday this week. Fingers crossed that she’s there for good now! Symptoms: occasional pains that hint at something more sinister, but nothing that makes me feel like this baby is coming anytime soon. Baby Prep: we’ve done all the prepping and packing that we’re gonna do; we’ve got the basics and will wing the rest of it. Parents have been successfully caring for newborns without all the bells and whistles offered at Babies R Us for thousands of years. Looking Forward To: not being in labour limbo anymore! How I’m Feeling: most days pretty tired and useless. Also SO curious to know when the baby will arrive. Patience is not a particular strength of mine, and the fact that her arrival could be mere days away or still four whole weeks is a bit agonizing. Sleep: certainly not the best sleeps I’ve ever had, and my hips ache when I wake up, but it could be worse (and will probably get worse very soon!). Position: baby is still head down, but I get the feeling she is posterior (aka “sunny side up”) these days so I’m hoping she turns around before d-day so I don’t have a long back labour. Symptoms: fat ankles, achey hips, inability to fit into clothes I fit into even a week ago, increasing fatigue, and growing listlessness (and excitement, and apprehension). After rejoicing in having no symptoms in my update last week, I certainly feel like I’ve turned a corner into “real” pregnancy now. But since I made it to 38 weeks without a whole lot of trouble I can hardly complain about that! Appreciating: bedtime – I’m relieved to go to bed every night knowing that I’m a day closer to being back to normal, or whatever our “new normal” is going to look like! At the same time though, I’m also appreciating the kicks and movements and quiet moments with the baby still safe on the inside. Prep: I spent the week making soups and stews for the freezer that we’ll be able to heat up easily later, and finally got my hospital bag in order. I also cut the tags off the carseat (ha) but it’s still in the apartment rather than in the car. Looking Forward To: at this point all I’m ever doing is looking forward to my daughter’s birthday! I’m eager to know how everything will go, anxious to know how I’ll cope with it all, and very, very excited for that moment when we finally get to meet her face to face. How I’m Feeling: great, actually! No aches, no pains, no twinges. Gonna high five this baby when she comes out (hopefully the trade-off for a great pregnancy isn’t a terrible labour). Sleep: sleeping the same as I’ve slept all pregnancy – mostly well, with 3-5 bathroom breaks per night. I fall asleep pretty easily again afterwards though, so it hasn’t made me feel too tired during the day. Exercise: I’m not doing any exercise other than my daily walks, and that feels like the right choice for me at this point. Position: an ultrasound on Wednesday confirmed what we had already suspected – that the baby is head down and sinking lower all the time. 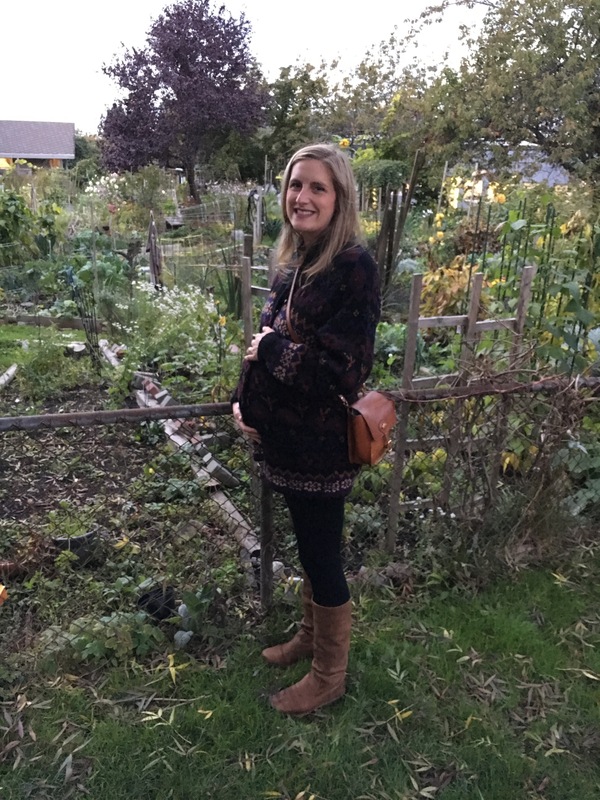 Symptoms: lots of movement from the baby, no weight gain for the past month or more, and just feeling big and slightly uncomfortable (as expected!). My back only hurts when I’m sitting in one position for a long time, so I keep moving as much as possible. Appreciating: that we’re finally getting super busy at work so I have a lot of projects that will hopefully keep me distracted over the last few weeks and help the time fly by! Baby Prep: packed the hospital bags for my two babes (BabyProc and Tom), but still have to pack my own. Despite reading blog posts about it and receiving numerous gems of wisdom from family and friends I remain plagued with indecision about what to bring and what to leave behind, so I think my official decision is just to leave it ’til the last minute and pack my bag during early labour. Looking Forward To: well obviously we’re always looking forward to meeting this baby, seeing what she looks like, and putting her in all of her adorable sleepers. But I can’t write that every week, so today I’ll admit that I’m looking forward to doing non-pregnancy stuff, like rolling over in bed with ease, wearing (and shopping for!) non-maternity clothes, and enjoying a nice cider or some rye with my Pops at Christmastime. How I’m Feeling: My two biggest problems right now are patience, which won’t surprise anyone who knows me, and comfort, which won’t surprise anyone who has ever been 36 weeks pregnant. Exercise: daily walks – mostly long (1hr+), sometimes short (30min). Movement: still a lot of movement but it’s different movement now – she doesn’t have the room to really wind up for those punches so it’s more of a rolling around kind of action. She responds when we poke her, but probably because she doesn’t know what the heck is going on (…or does she? See previous post…). Position: at our last few appointments the midwife thought she was head down with her feet tucked cozily into my rib cage. It still feels that way, but we don’t know which way she’s facing and I would really like her to not be sunny-side up, since both the women I know who have endured back labour had a 36 hour labour (one was my mama!). Symptoms: my feet and ankles were quite swollen last weekend but my blood pressure is okay so I’ve just been making an effort to put them up for an hour or so mid-day, since I am basically on my feet all the time. Appreciating: that I’m so close to the end, though another month sometimes seems like an overwhelmingly long time. Contractions: I thought maybe I had one or two Braxton Hicks the other day, but I don’t really know. I guess nothing noteworthy yet! Baby Prep: I should probably pack that hospital bag sometime. Looking Forward To: taking her home! 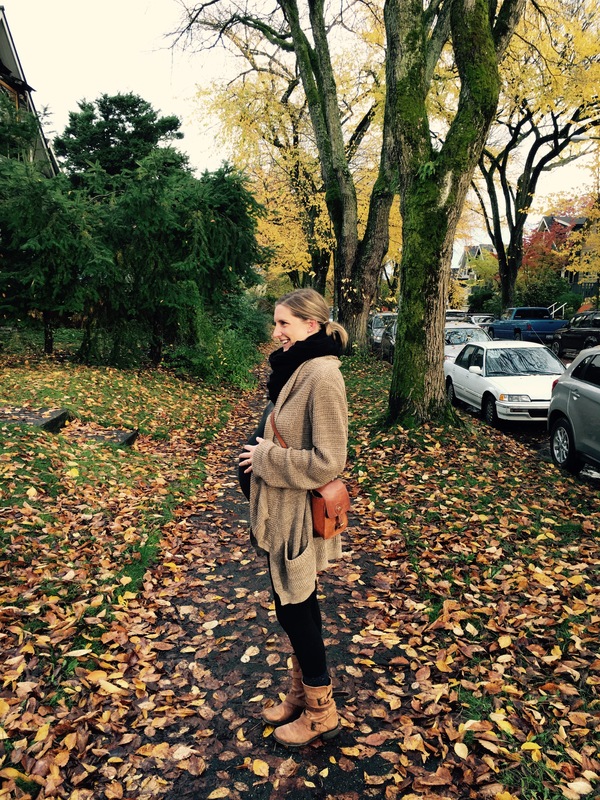 Hello, bump here! Good lord, things are weird in here! Only a few weeks ago I had enough space to swing a cat but now the walls are slowly creeping in. I’ve tried elbowing and kicking the walls but the entrapment feels inevitable. It is nice and cozy though. “Only 5 weeks to go” I keep hearing from the voices in the ether. I have no idea what will happen in 5 weeks or what 5 weeks is but I’m sure it’s very important as the voices keep talking about it. It almost feels like the walls are poking me when the voices talk about the “5 weeks”, but that’s crazy. I’m still having fun with the kicking stones I found a few weeks ago. They’re so much fun! They slowly drift towards and then away from me in a rhythmic motion and I just can’t help but kick them. Kicking them also makes the walls shake and poke me and they seem to communicate with the screechy voice. I like the screechy voice so I try to kick the stones as much as I can. The deeper voice is talking to me more often, which I like. It keeps telling me it has secrets for me if I move my head downwards but nothing happens. I’m not sure what secrets are but they sound fun, I’ll keep trying to get closer when I hear the voice. It’s tough to hear the deep voice at times as it’s so loud in here (note: if it ever went silent I’d go insane!) but sometimes it tries to speak in a melodic tone. It’s terrible, and seems to upset the other voices as well. The voices sound stressed at times. The higher one talks about movement issues and sometimes seems to worry about the future (whatever that is) and the deeper voice sounds stressed with things called work and money. They only sound stressed at times though so that makes me feel good. If I ever meet the voices I’d want to tell them not to worry. Just relax and kick things and all is good! That’s all for now. I think I might squirm around for the rest of the day. Bye!